Ephemeral mapping of North America immediately followng the Louisiana Purchase. 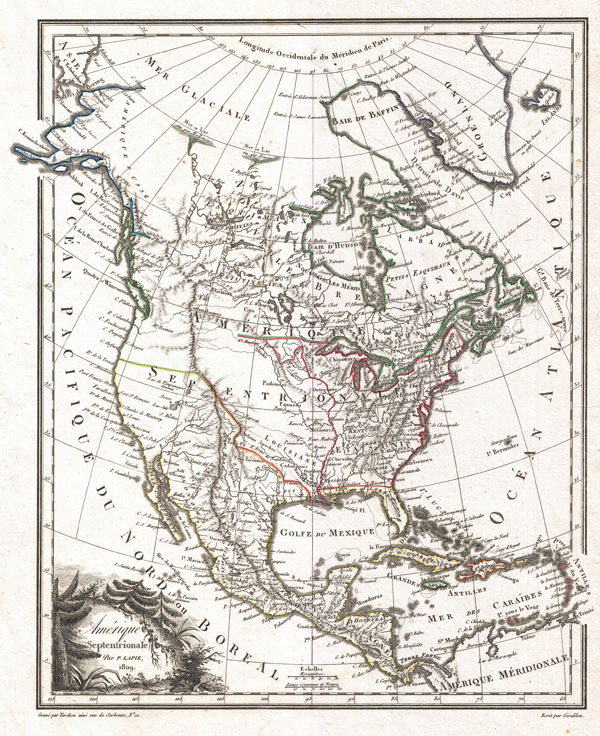 A highly uncommon and desirable 1810 map of North America by the French cartographer Ambrose Tardieu. Depicts all of North America including Canada, Mexico the United States at a formative but ephemeral period shortly following the U.S. acquisition of Louisiana but prior to both the acquisition of Florida, Texas and Upper California, and the 54°40' Oregon boundary dispute. Mexico controls much of what is today the Southwestern United States and California. As this map was being produced several major events were in process that would eventually redefine the cartography of the region, but Tardieu had access to little of this information. Instead he relies on old Spanish records, speculations, and the data collected by the Dominguez-Escalante expedition of 1776 and 1777 and Zebulon Pike's expedition of 1806. Both Lake Timpanagos (Great Salt Lake) and Lake Teguyo (Utah Lake) are appear - though both are speculative and malformed at this point. Also shows are speculative courses of the Colorado River in the Rocky Mountains. Louisiana is joined to the united states by the map's color coding, but demarcated along the Mississippi River as a distinctly separate zone. The northwestern boundaries of Louisiana in what is today British Columbia, Oregon and Washington, remain indistinct. Tardieu recognizes Russian Claims to Alaska as well as French and British Claims to Canada and certain properties in the West Indies. In the far north hopeful traces of the Northwest Passage remain, with the seas identified by Mackenzie and Hearne - likely the Dolphin and Union Strait - duly noted. Greenland is also, curiously , attached to the mainland. A decorative title cartouche in the lower left hand quadrant details some of the flora and fauna of the continent.